Late in the afternoon on September 20th I stood under the east end of the walking bridge that connects a path in West Dundee’s South End Park with the Fox River Trail. 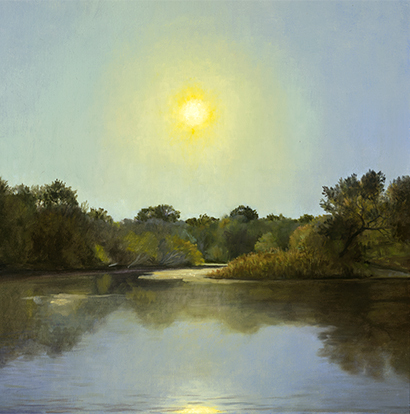 I was there to paint the landscape under the setting sun as it hovered over the slow moving divide in the river that slips both West and South and passes around a large island. It was warm, temperature in the mid 80’s with just the mildest breeze. I had hoped for a few clouds, but no, there was not a cloud in the sky. The sun was due to set around 6:45. I had arrived a couple of hours early to block in some of the basic forms noted in the drawing I made a few days before. I usually try not to look into the sun, but in this instance the sun was an essential part of my subject. I put on sunglasses and before long I lowered the shading neck flap on my cap. A fisherman waded under the west end of the bridge, now merely a dark silhouette against the flood of light washing across the river. The sky continued to brighten, even to bleach in the path of the setting sun. Cloudless, the sky around the great authority of the sun felt empty, blank, almost nonexistent. Its thin clarity offered no atmospheric echo, no conversation partner to reflect back the sun’s dominating presence. The singular weight of the sun overwhelmed me; I could not lift my eyes to it. I fumbled around the edges of the river for visual solid ground on which to lean, but retinal weariness set in. Eye-worn, I began to lose my sense of discrete forms and colors. I stabbed at my canvas with shaky brushes loaded with hunches, guesses at what was dissolving all around me. I was lost--in light. My artistic task was to place that experience within the counter-balance of a persistent landscape that actually had not dissolved. The painting is a metaphor holding together what we know is there with what has become brilliantly obscure, invisible to us. I can’t paint the invisible, I can only try to make what is visible evoke the invisible.